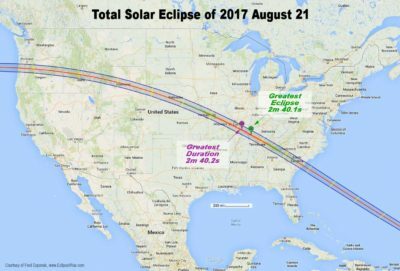 The August 21, 2017 eclipse will be the first solar eclipse with a path of totality crossing the Pacific coast and Atlantic coasts of the USA since 1918**(see next paragraph). It is historic due to the fact that it will be the first time that an eclipse path of totality makes landfall exclusively within the United States since before the country’s independence in 1776. The 1918 eclipse began in Japan; the August 21 eclipse begins in the Pacific Ocean. The total solar eclipse of June 13, 1257, was the last to make landfall exclusively on USA land. 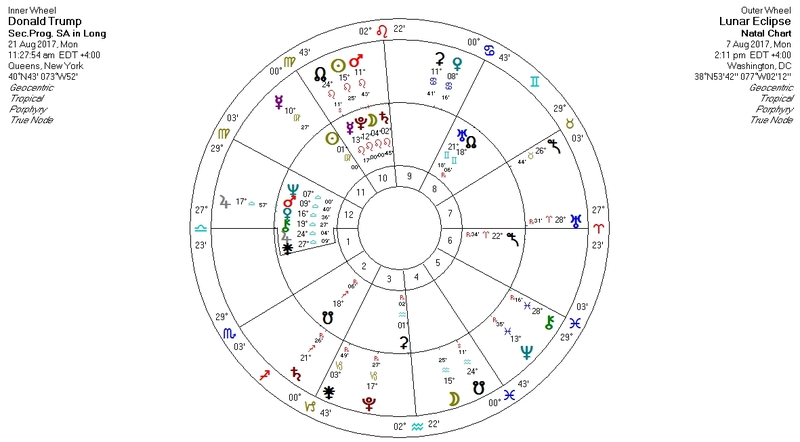 *An interesting note: at the time of the solar total eclipse of Jan 8, 1918 (the last eclipse to run across the USA from Pacific coast to Atlantic coast), Uranus was retrograde at 27:42 Aquarius, which opposes the August 21 2017 solar eclipse of 28:52 Leo. WW1 was happening at that time. (Interesting there was a transgender/cross dresser movement growing too.) The August 21 solar eclipse path touches the solar eclipse path of July 9 1945, also from Saros Series 145. On August 9, 1945, the first nuclear bomb was used by the USA on Hiroshima, killing 70,000 people. A few days later, 70,000 died at Nagasaki. The total solar eclipse of Jan 8, 1918 also began in Washington State and exited the USA in Florida. Denver was the hot spot of the eclipse. (It was part of Saros Series 126, not the same family as the August eclipse). The Aquarius south node activation stimulates political and social trends, restructuring, and upheavals. In general, the transit puts more attention on matters to do with science, technology, innovation, independence, liberation, emancipation, separation or separatist movements. Astrologers also watch eclipses for geophysical events. The natal house or planets that receives stimulation from the south node in Aquarius transit points describes the area of life or subject matter that gains new life and attention; where you experience an increasing new awareness, opportunity, urge, disruption, or challenge. For the individual journey, the south node in Aquarius can prompt a time of personal awakening and lifestyle reinvention. It is also a signature that can stimulate cellular memory or bring trauma consciousness to the surface. The natal house or planets that receive stimulation from the north node in Leo are creatively stimulated. They are given new life, hold evolving new potential which is in direct relationship/proportion to what occurs through the south node stimulation. To demonstrate the point in very simplistic terms: as the south node in Aquarius activates a restless urge to be free, to experiment, the north node in Leo stimulates a consciousness that puts attention toward new self expression. It is a naturally evolving creative process. The rulers of the nodes must always be incorporated. Uranus retrograde (28:31 Aries) in trine to the solar eclipse (28:23 Leo) is a major contributor. This aspect suggests an exceptional opportune time for trying something new on for size, for personal reinvention and exploration. It gives great life/great creative force to that which is already on brew. The solar eclipse is in new phase to the north node, which suggests a new program is underway. Mars is in balsamic relationship to the transiting north node and the eclipse which suggests a very potent time of seeding and completion. Mars is in a disseminating trine to Saturn which suggests growth of significance especially related to issues of authority, government, and legitimization. Chiron retrograde in Pisces (27:47 Pisces) is a suggestion of exposure, added vulnerability, and of something incomplete. Chiron in Pisces raises mass consciousness and puts added attention on ultimate ideals, on potentials (lost or gained), on the famous or infamous, on sacrifices, scapegoats (collective, individual), vulnerabilities, and on loss (mass or personal. Chiron in Pisces can also make us more aware of what has been lost already. The solar eclipse continues to be stimulated by the transits of Mercury retrograde from August 30 to Sept 5 and by Mars in Leo, Sept 1 to 5. A solar eclipse is a more potent new moon. It sets an exceptionally opportune time. It can be event generating or it can be a process. As stated earlier, this eclipse has been triggered since May and it will continue to unfold. Look to the next pair of eclipses – the lunar eclipse on January 31, 2018 and the solar eclipse on Feb 15, 2018 to fill in more of the equation. It isn’t likely that the stars will lighten up President Trump anytime soon. While there is much speculation in astrology world as to what the solar eclipse of August 21 will deliver, it must be noted that the eclipse has been triggered already. As I’ve stated previously, the active stimulation began on the day the transiting nodes advanced to the Leo/Aquarius axis. May 9, 2017 was the same day that Trump fired James Comey, the C.I.A. director. Since then, there has been no let up for Trump and his family. (There’s beeNon action since the day Trump took office and the Venus retrograde cycle which was triggered in late January and coincided exactly with Trump’s first failed Muslim travel ban.) We’ve been recently shocked by the surprise ban on transgenders serving in the military. White house staff are continuing to be hired and fired. Even more than that, Trump has global concerns, namely North Korea flexing its nuclear muscle. At present Mr. Trump is working hard to ditch Obamacare (6th) (the skinny bill failed to pass in the senate), to prevent his tax returns from scrutiny (8th house Chiron retrograde), to clear up the issue of Russian meddling and collusion (undermining of Chiron in the 8th). He has just lost Shawn Spicer, his press secretary (9th), there’s the ongoing conflict with the media (9th house) and the continuing fallout from pulling out of the Paris accord on climate change (9th house). As of July 31, he has fired Anthony Scaramucci after 10 days as his press secretary (Spicer’s replacement) and has sworn in John Kelly, retired colonel as his second chief of staff. 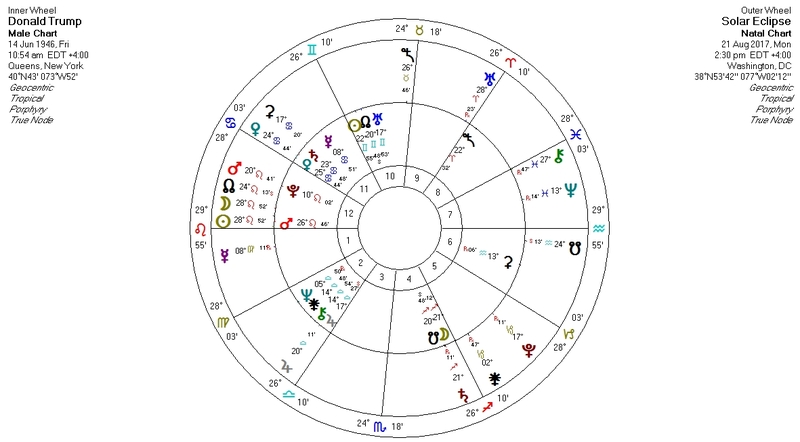 Uranus trine his ascendant (for both eclipses) suggests he can get away with a lot, but Chiron in Pisces quincunx his Ascendant suggests he is vulnerable and cannot escape everything. 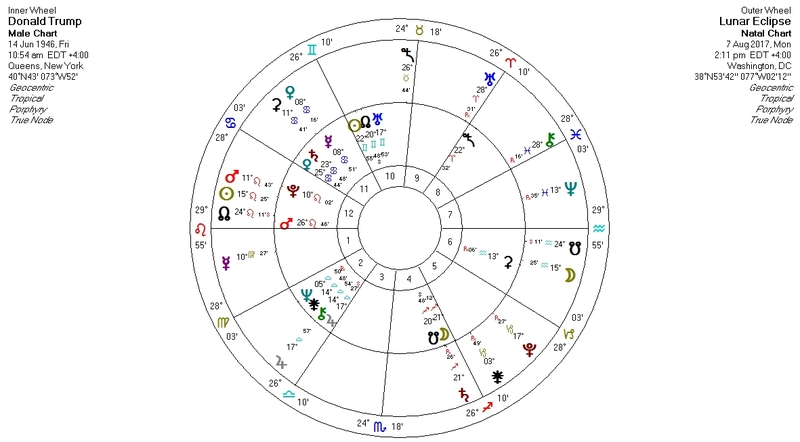 Transiting Venus in Cancer on his Mercury suggests a key person or family member (Donald Trump Jr at the moment) as a major player (someone who can deliver a shockwave or who presents opportunity.) The transit of Venus on his Mercury is also descriptive of the public, some supportive, some not. 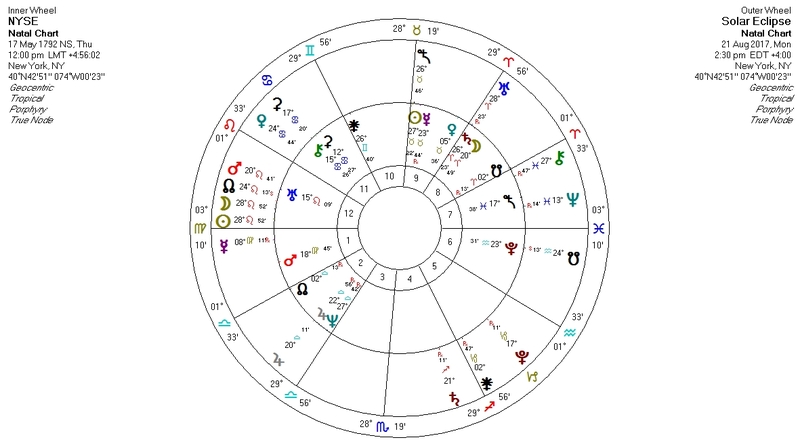 Usually a progressed chart is only used with a natal chart, but I present it here on its own with the lunar eclipse as it is visually demonstating. The position of Uranus in the 7h house is representational of the love/hate relationship with the public (7th house.) Also note the transit of Mars in Leo in the 10th which is moving to conjunctions with progressed Pluto and Mercury. The transiting sun will have crossed progressed Pluto and Mercury over the preceding couple of days. A lunar eclipse brings matters to a peak. A solar eclipse infuses more dynamic life into endings and beginnings. The solar eclipse on August 21 all greater than usual and potential for several reasons. It is a total solar eclipse which makes it more potent and it is in the sign of Leo very close culminating degree. With Uranus in trine to the eclipse, watch something fresh or brand new to spark. Social trend or a wave of action is to be expected. 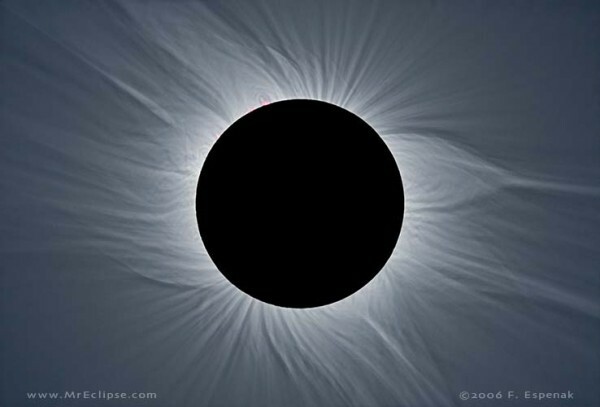 Eclipses are often linked with geophysical events. Notes that Uranus facilitates and/or is facilitated by this eclipse. Uranus correlates to social trends, speculative markets, technology, science, innovation politics, and terrorism. Despite the fact that Uranus is in favourable position to the eclipse, it can inflame or incite or produce added volatility, or aggression, grandstanding, a show of force or might. 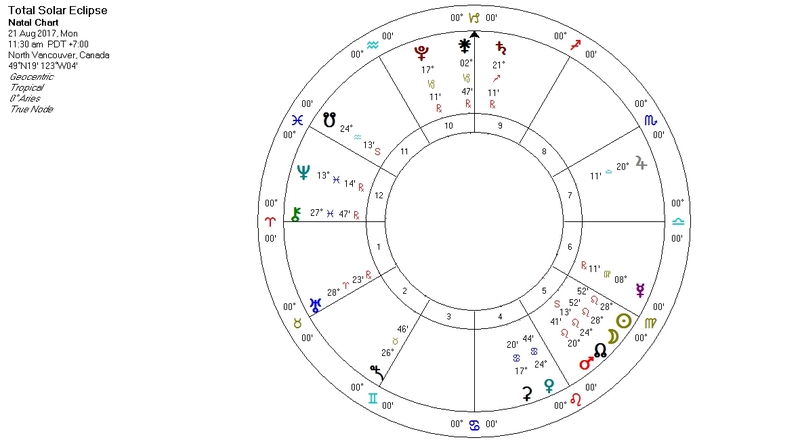 If Donald’s chart is correct, this eclipse holds tremendous potency as it is on the horizon, translating (picking up) the energy of Donald’s natal Mars in Leo and infusing it into his Leo Ascendant. This eclipse will play out in his 10th house, because the natal sun is the ruler of his ascendant and of the eclipse. It is Gemini based, which suggests some official paperwork signed or some official announcement made. (to continue dispositing, the Gemini sun, references the natal Mercury which has already been stimulated by the transit of Venus during the lunar eclipse. Mercury in Cancer is desposited by the natal Moon in Sagittarius which is disposited by Jupiter in Libra which has just experienced a Jupiter return (12 year cycle) and is desposited by Venus in Cancer in the 11th house, conjunct Saturn (the family business). There is much speculation about impeachment. The Gemini Sun contact could produce more than one thing. As of July 31, Trump has just made an agreement with Japanese president Shinzo Abe to do more re the North Korea nuclear threat. The Uranus transit will continue to trine Donald’s Mars and Ascendant through the rest of its transit through Aries (to spring of 2019) and once it moves into Taurus, it will trine Donald’s progressed sun in Virgo (to 2020). 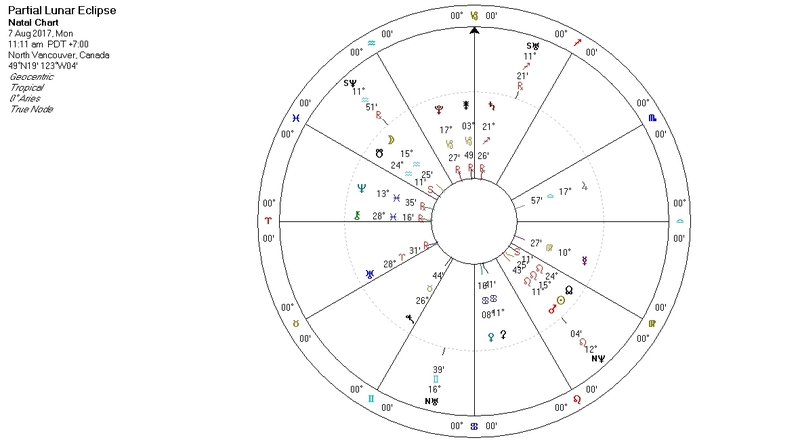 Both the lunar and solar eclipses are relevant on Putin’s chart, Bashir al asad’s chart, Kim Jong-un, to name but a few. **Check out the articles section for more on Kim Jong Un & North Korea’s astrology.